Left Wing hate mongers ascended on the Big Easy. Since liberals want to brand, tar and feather patriotic Americans within the Tea Party movement as being nothing more then a bunch of redneck, racist hate mongers, I believe that turnabout is fair play in this case. The Southern Republican Leadership Conference was held in New Orleans last week. The conference was carried on C-PAN. The speakers were great, their straw poll was a joke however. Anyways during the conference, a group of protesters were outside bashing Bobby Jindal for no apparent reason. No these weren't the Tea Party activist folk. The folks that were vocally attacking Bobby Jindal and Republicans were liberal Democrats. Now since Governor Jindal is an American of Indian descent, could it be said that the crowd attacked Bobby because of his race which would make the liberal protesters a bunch of liberal racists? I can imagine the heads of liberals exploding while reading this. Put this on a two tier scale and weigh it out. Both Bobby Jindal and Barack Obama are non white political figures. So why would it be acceptable to label the Tea Party folks a bunch of racist and not label the protesters that were at the Southern Republican Leadership Conference as a bunch of racists too? The protesters in New Orleans were mostly "white" by the way. Isn't that the "taboo race" in which to be a Tea Party activist according to liberal media pundits? Since Bobby is the Governor of the state of Louisiana, what did these white liberals mean when they chanted "Bobby Jindal go home"? The last time I checked, New Orleans is in Louisiana. Here is something that separates the Tea Party activists from the liberal group that protested against Bobby Jindal and the attendees at the SRLC. The Tea Party folks can give verbatim the policies for which they have a strong disagreement with Obama and congress. The group that protested against Bobby didn't give or display any policy reasons for which they slammed Jindal's name. It looks like the protesters that were in New Orleans were out to just show hatred rather then trying to communicate a message of constructive criticism. This is the face of "the real mob" the media won't show, because it isn't aimed at a person of an ethnic group that is liberal. It cracks me up every time a liberal tells me that they can't be racist. The bowing embarrasement strikes again. What is up with this empty suit known as Barack Obama? The media does everything in it's power to hide the flaws of Obama at every turn,but they can't hide all of them. It usually cracks me up when the Obama cultists try to trash the intelligence of Sarah Palin, yet ignore the obviously true life flaws of their beloved hero. FYI, Sarah Palin has yet been photographed bowing uncontrollably to world leaders unlike Barack Obama. One of Mr. Obama's notorious flaws is his uncontrollable bowing to people. I know that Obama is subservient to the will of the world, but his constant bowing takes it to a whole new level. I thought I've seen everything a few months ago, when Obama bowed to the mayor of Tampa Florida. Still waiting for his loyalist to explain that. I'm not an expert on Asian culture, but I'm pretty sure that the Chinese don't bow to each other. I know the Japanese do. 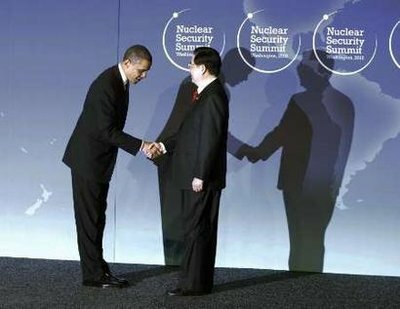 Here a picture of our idiotic president once again making a fool out of himself yesterday by bowing to Chinese President Hu Jintao. It's bad enough that our country is beholden to the Chi-coms, because they hold a good chunk of nation's debt. Obama's subservient bow to Mr. Jintao presented the picture that the Chinese do indeed own our country. They say that a picture is worth a thousand words. It is time to lay off of Steele and refocus on the goal at hand. "I think what we ought to do is focus on Democrats. We have a real chance to elect [House Minority Leader] John Boehner as speaker and to elect [Senate Minority Leader] Mitch McConnell as majority leader." Though I am annoyed to a certain extent with Michael as is with many conservatives and Republican insiders, we all share a common goal that we can't stray away from. In less then six months Republicans have a chance to politically cripple Barack Obama and limit any further damage he can cause going forward in the 2012 election. The media and liberals would love for the Republican Party to start openly putting Republican vs Republican in regards to Michael Steele pro or con. I'm not saying that Republicans need to not question Steele's motives and actions. I am saying that Republicans need to not air their distrust or disdain for Steele out in the open like Steele did himself on Good Morning America. The left is trying desperately to tar and feather the Tea Party movement in an attempt to shield Democrats from the backlash that is brewing over Obamacare. The left will take any unknowing help it can get in creating the template of a "GOP Meltdown". As I stated before, now is not the time to deal with Steele. Republicans need to keep their eyes on the prize and not be duped into Republican infighting. I agree also with Gingrich when he said "Steele should remain in his post heading into the crucial round of elections this November". The November election is bigger then Steele, it's about the fate of our country. We can't lose focus of that. As a black man who is a conservative, I stand up for my principals in what I believe is right. I don't compromise my integrity in order to be "liked" by people who don't share my ideology. I've been called every racially charged word in the book by liberals, you know the people who claim to embrace "diversity". Michael wants to be liked by his enemies, yet I on the other hand can care less about my enemies liking me. Actually the more I annoy liberals the happier I become for some reason. 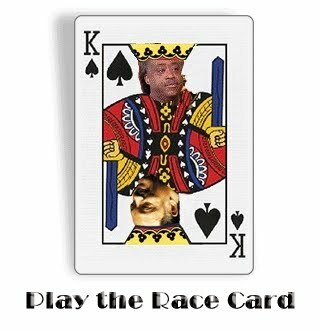 Recently, Michael has been gingerly using the race card as a defense mechanism in order to take attention away from his gaffs and screw ups lately. That is something I know a person like Ken Blackwell would have never done as the RNC Chairman. Sometimes I wonder is Michael trying to prove to black Democrats that he is "still black" or is he trying to convince himself? I find myself actually starting to question Michael's mental state. I raised an eyebrow a few years ago when Steele claimed that George Bush was his "homeboy". I don't know many middle aged, college educated, black men who call the president their "homeboy", but I digress. When I was watching Michael Steele on Good Morning America the other day, I swore for a moment I was watching a black liberal suffering from a case of "SIRVS". That's short for Self Inflicted Racial Victimization Syndrome. Maybe Michael was lent some literature by the race hustling poverty pimps Al and Jesse on "why you are victim and how you can work it to your advantage". Michael claimed to George Stephanopoulos that "being black gives him “slimmer margin for error". I believe without a shadow of a doubt that had to have been one of the dumbest comments to ever roll off the tongue of Michael Steele to date. When Republicans lost control of congress and most of the governorships in 2006, that was an humiliating defeat for the party. When they lost the White House and even more congressional seats in 2008, that was when the Republican Party was at it's absolute low. In order for the Republican National Committee to start to regain trust among the voters, they couldn't afford anymore controversies or unprincipled candidates running within the ranks. So if the margin of error for a black man is so slim according to Steele, why did the RNC select him them knowing that the party couldn't afford any errors going forward? I'm using Michael Steele logic just to let everybody know. As you all can see, it really doesn't add up to much. Every political party is out to win elections, and they tend to put what they see as their best and brightest people in the positions to get the job done. Michael doesn't understand that he was selected due to his experience working within the RNC. For him to play the race card on Good Morning America not only betrays the trust given to him by the Republican National Committee, he's also using an external factor as a reason for the internal problems he is having. I can't believe I have to agree with Robert Gibbs on something. Robert Gibbs commented on Michael the other day about him using the race card. Robert said "Steele's Problem Isn't The Race Card, It's The Credit Card". It just goes to show that even a waste of space such as Robert Gibbs can even grasp common sense once in awhile. Michael's actions is what has landed him in hot water with the Republican donors. It is his actions that have cause many to question his judgement and leadership with in the Republican Party. Race has absolutely nothing to do with this. I'm not sure that with everything that is going on with Steele it is the right time for him to step down as RNC Chairman. The last thing the party needs is for the liberal activists posing as journalist to create a shallow drum beat controversy up until election day. The media is licking their chops for another "culture of corruption" scandal by the GOP in order to take the attention away from the heavy projected Democrat loses. Should Michael step down? If he can't get his personal act together, then yes he should. The best advice I can give Michael is for him not to speak when he feels the urge to say something. 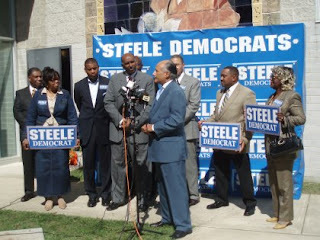 Here's Ken Blackwell on Mr. Tingle's show discussing Michael Steele. As many of you might have noticed lately, the Republican National Committee Chairman Michael Steele has been in the news lately for all the wrong reasons. A RNC staffer was inappropriately using party donations at an adult themed night club. That incident wasn't Michael's fault, but that incident did bring to light the spending habits of Michael when it comes to living high on the hog on the donations of Republican donors. Michael is from my state of Maryland, and I voted for Michael when he ran for the U.S Senate against Ben Cardin. I voted for him mainly, because I was voting against his opponent Ben Cardin. Another reason I supported Michael was because of how black and white liberals treated him when he was the Lieutenant Governor and also during his run for the U.S Senate. I can't say that I ever supported Michael based on conservative principals, because he isn't a solid conservative. This is the problem I see with Michael Steele as a person. Michael seems to be suffering from a "racial identity crisis". On one hand, he claims that he supports the platform of the Republian Party and is a conservative, yet he plays the racial victim game and wants to be accepted by black liberals as being "authentic". The reality that Michael doesn't want to accept is that he can't have his cake and eat it too. When Michael was a guest last year on the now cancelled D.L Hughley show on CNN, Steele was so desperate to prove to D.L that he was his own man, he got played like a useful idiot by D.L into attacking Rush Limbaugh. When I saw the interview, I knew my gutt instincts were right and that the Republican National Committee made a mistake in selecting Michael to be the Chairman. That interview came just two days after Limbaugh's speech at CPAC, and it didn't take a rocket scientist to understand that the only reason Michael was invited on Hughley's show was for him to be played like a fool into attacking Rush. Anybody who follows politics knows that the only time a person can be the leader of his or her political party is when he or she is elected President of The United States. I guess Steele and Hughley didn't realize that fact or maybe Steele didn't. This misfire by Steele was only the first of many more to come. I openly backed Ken Blackwell for Republican National Committee Chairman as did the vast majority of conservatives. Most of the conservative think tank organizations, foundations, and bloggers knew that Ken was a much better fit for that position then Michael was. I believe the reason Michael was ultimately chosen to be the RNC Chairman was for two reasons. The first reason is that Michael has the experience of being a Chairman within the Republican Party. He was the Chairman of the Prince George's County Republican Party, the Chairman of the Maryland Republican Party and also the Chairman of GOPAC. The second reason is due to him not being a solid conservative but more so a partisan insider who wouldn't do anything to disrupt the moderate influences within the party. Note to Chris Matthews: The race card has become torn and faded. Ever heard the expression "going down swinging"? That describes the left at this point. They've committed political suicide by bum rushing one of the most unpopular pieces of legislation in our country's history down our throats. So what is the strategy of the Democrat's allies in the media to negate the damage? The strategy is to go into overdrive calling anyone who opposes Obamacare as a "racist" or has a "racist motive". I've gotten to the point where I don't comment on MSNBC or CNN, because I actually care about their in your face activist journalism. At this point, it really doesn't even matter. They as with the rest of the media have become irrelevant, obsolete and exposed for who they really are. I bring up the antics of people like Chris Matthews, Keith Olberman and others in the Baghdad Bob media to constantly prove a point. The point is that most Americans have tunned these clowns out a long time ago for a reason. We all know that the left uses race when it comes to politics like a pimp uses prostitutes to make money. Chris had on his show yesterday the Attorney General of Georgia Thurbert Baker who is a black Democrat. He has refused to follow the order of the Governor of Georgia Sonny Perdue who is a Republican and is white to file a lawsuit against the federal government in trying to stop Obamacare. Well leave it to good ol Chris to bring the taped together and extremely worn out race card from the bottom of the deck yet again in a pathetic and far reaching attempt to try and label Sonny Perdue as a racist. I have no idea what the Civil Rights Bill of 1964 has to do with Obamacare of 2010. Maybe if I applied the two while playing the Kevin Bacon game, I might come up with something of a connection. I'm going to go out on a limb with this one. I have a hunch that if Sonny Predue wasn't a "white Republican", Chris would have never brought up the 1964 Civil Rights bill. Chris Matthews "would he have been doing the same thing back then if he were governor: calling it unconstitutional to demand that stores are open to everybody? I'm asking a tough question: is he playing the same game those people played back then"
I will say it again. Liberals have taken the noble and historic era of the Civil Rights movement and has prostituted it like a cheap whore. It has been bastardized to such an extent, the pureness of the Civil Rights movement has been tarnished. By the left continuously applying race, racism and the Civil Right's movement to every single issue and cause that has absolutely nothing to do with race, it blurs and desensitize the importance of what the movement was about and what constitutes "real racism" in 2010. It's great to see that many people are no longer being silenced into submission by the left's desperation tactic of racial smear. I know this won't be my last story on liberals and their use of race to silence their opposition. This is just another attempt at how low these vernon will sink to try and shut up and tar and feather those they can't debate in the arena of ideas. Why are Democratic members of congress hiding from their voters? That is a great question that is in sore need of an answer. When Democrats were surrounding Obama as he signed into law one of the most destructive bills ever conceived in congress a week ago, one would think that Democrats couldn't wait to go back to their districts and states for Easter recess so they could bask in the appreciation of their ever so grateful constituents. Welcome to reality, that isn't happening for them. Not only aren't Democrats getting any love from the voters they flipped off by voting for Obamacare, they are actually hiding out from them. Here's a thought. If Democrats would have done the will of the people instead of going against them, maybe just maybe they wouldn't have to be hiding out from them now until the Easter recess is over. Isn't that a crazy thought? If Obamacare is so great as Obama and the Democrats promoted it before it was shoved down our throats, why aren't they out communicating to voters how great it's going to be? They have the perfect opportunity now to "dispel the lies" that they claimed conservatives made up about the Obamacre. All I can say is that they can hide now from the voters, but that won't work come November. It's been over a week, and Obama is still trying to con the American people into embracing this. It's amazing how this guy thinks so little of the intelligence of the American people. Since Democrats want to hide out, can we just stop calling them congressmen? How about we just call them cowards or rats instead. Well they've been rats and cowards anyways, but lets just make it official. Cowards run from a confrontation, and rats run from the light.